At Budget Blinds of Binghamton, we're your local neighborhood experts that truly understand your needs. We're in your neighborhood, we know the local Binghamton weather and community, and we’re backed by the #1 provider of blinds, shades, and drapes in North America. Over 25 years of customer satisfaction gives you peace of mind that only comes with choosing the proven leader. We bring the showroom to you in Binghamton. We expertly measure your space, install beautiful window treatments, and back it up with the best warranty in the business so you can sit back and relax in the beautiful, Binghamton weather and sunshine. We serve to give you the best in window treatments, so you can rest easy knowing your space will be beautified and optimized with window treatments that fit your individual needs. Throughout the Finger Lakes and beyond, if you’ve been thinking of upgrading your home with stylish, enduring window fashions, then Budget Blinds serving Binghamton and the Southern Tier is here for you. 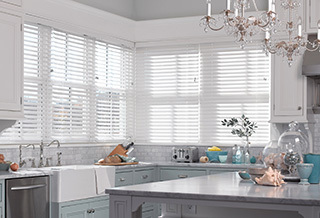 Whether it’s the value and versatility of modern blinds, the light diffusing properties of shades, the artisan craftsmanship of wooden shutters, or our elegant drapery, our locally-based team has you covered. To ensure you have the absolute best in personalized service, our highly trained design consultants bring our entire showroom of blinds, shades, shutters and drapery to you, in the comfort of your own home. This FREE design consultation by itself is a significant value, and it’s just one way that Budget Blinds serving Binghamton and the Southern Tier puts our heart and soul into elevating your home’s décor. Attention to detail, precise measuring, and expert knowledge on the latest materials, fabrics, and colors make Budget Blinds your obvious choice for custom window fashions of incomparable value.